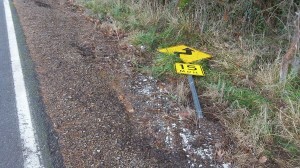 A road sign was, we hope, the only victim of this “road departure” on Bryant Drive. 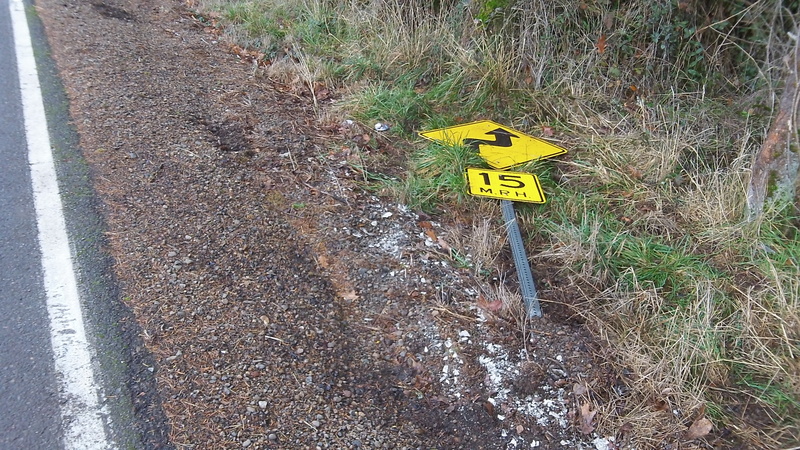 On Dec. 22, a 16-year-old driver from Brownsville lost her life when her vehicle crossed the center line in a right-hand curve on Highway 228 in Linn County and collided with the front end of a tow truck coming the other way. It was what the Oregon State Police called a “road departure crash,” the kind we always worry about, especially when we’re on one of Oregon’s winding two-lanes. Every time we approach a curve, especially a right-hand curve around a hill where we can’t see the other end, we fervently hope that oncoming drivers stay on their side of the center line. And when we’re coming to a left-hand curve, we likewise expect that drivers heading our way are not going too fast or otherwise fail to make the turn. The state police say that any time a collision results from a vehicle crossing the center line or going off the road on the other side, that’s a “road departure crash.” And in a press release about the Dec. 22 accident on 228, the OSP said that type of collision accounts for 66 percent of traffic deaths in Oregon.